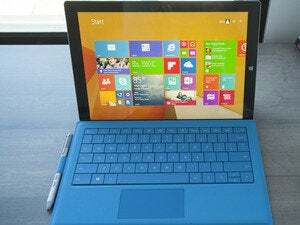 Microsoft is currently selling two Surface tablets: the Surface 2 and the Surface Pro 3. That may not be literally true, of course. But if you're browsing Microsoft's online store it certainly appears to be. 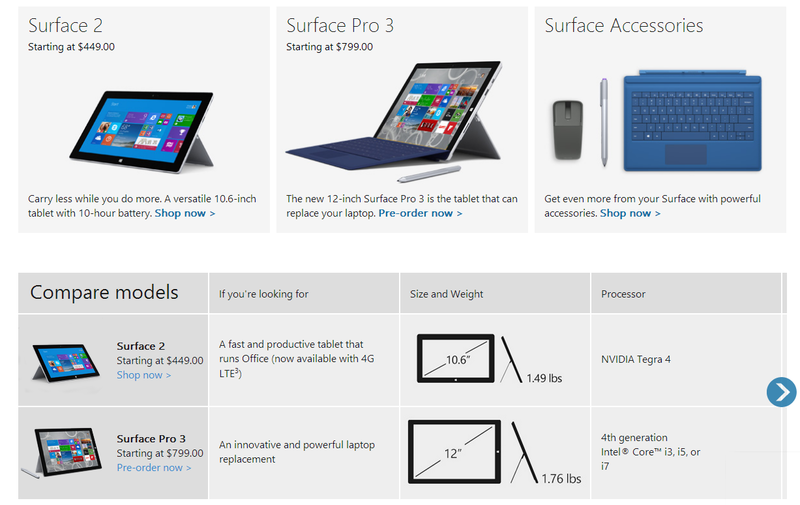 Behind the scenes, however, Microsoft is selling the Surface Pro 2, and at a discounted price. Microsoft announced the next-generation Surface Pro 3 tablet last month in New York City, complete with a new docking station, the price of which has yet to be announced. Microsoft doesn't appear to have dramatically changed its shipping plans, as previously reported—the low-end $799 Core i3 model of Microsoft's Surface Pro 3 will ship on August 31. But the Core i5 models officially have slipped a bit; on the Web site, Microsoft's Core i5, 128GB Surface Pro 3 will ship on June 30, not June 20. The Microsoft Surface Pro 2 has quietly faded from Microsoft's pages. That doesn't necessarily mean that the shipping schedule has slipped, however, a Microsoft representative noted in an email. “The customer response to Surface Pro 3 during the pre-order period has been great to see," he wrote. "New pre-orders of the 128GB Intel Core i5 SKU of Surface Pro 3 through MicrosoftStore.com will ship to customers in the U.S. and Canada by June 30. Customers who already pre-ordered this SKU and received an email notification of a June 20 ship date will still receive their orders on June 20." Consumers can still purchase Surface Pro 3 in-person and online at a Surface retail partner on June 20 as inventory allows, the spokesman added, while commercial customers should continue to speak with their authorized Surface reseller. But while you can still order the Surface Pro 2 directly from Microsoft, it's getting harder and harder to find. On the Surface page of the Microsoft Store (below) the company lists just two Surface models: the Surface 2 and the Surface Pro 3. (Searching for the Surface Pro 2 via the search box works just fine, however.) There, you'll find some hidden discounts: $100 off for the 64GB and 128GB models, and $200 off for the more expensive 256GB and 512GB configurations. Call it the Surface Pro 3 ship slip. Say what you will about the price in comparison to other tablets and notebooks in the category: PCWorld gave the Surface Pro 3 four out of five stars for its larger display, an improved Type Cover with improved stability, and the ability to quickly take notes using the new Surface stylus. That's the same score we gave the Surface Pro 2, which included an upgraded Intel "Haswell" Core processor and a second-generation kickstand. In all fairness to the Surface Pro 2, however, the improvements to the Surface Pro 3 place it in a class by itself. It's not surprising that Microsoft is de-emphasizing its older tablet. Updated at 9:46 AM on June 18 with comments from Microsoft.